The Bug-Out Bag or 72 Hour Pack is something that ever truly prepared individual should have. For those of you who don’t already know, a Bug-Out Bag is a compact survival kit that hopefully contains everything that you would need to survive for 72 hours. It is intended to be something that you can keep in your vehicle, or grab as you head out the door. It is packed, ready, and near at hand at all times. There is no hard and set rule as to the size of a Bug-Out Bag or what its contents should be. For some people it is a full-size backpack; for others it is a daypack, or a fanny pack, or a large purse. I personally use a 35mm camera bag. It is comfortable to carry, lightweight, rigid (so things don’t shift around), it has several side pockets, and it does not attract much attention. What you carry in your Bug-Out Bag is a matter of personal choice, but some things are common to nearly every bag. 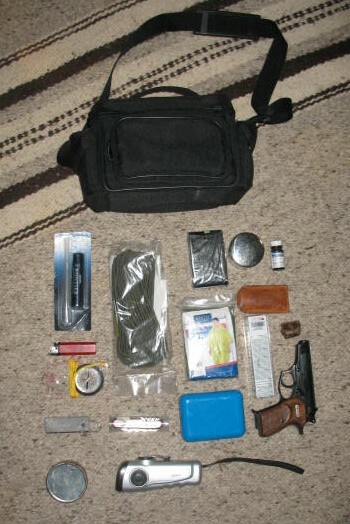 Fire making tools, a compass, a knife, a few medical items, water and/or water purification tools, and an emergency solar blanket are fairly common to all Bug-Outs. Some people include much more.